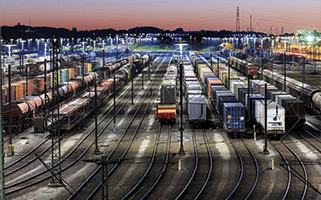 A software prototype for automated planning of empty freight wagons. In Europe, empty rail wagon disposition is conducted, almost without exception, manually. At Rail Cargo Austria, about 15 dispatchers schedule around 4,400 vehicles daily at peak time. About 1,500 different wagon types have to be taken into account. If the desired type of wagon cannot be provided, several possible replacement classes are usually specified in the orders. In the last few years, very complex rules have been defined at the European level. These allow, on the one hand, the disposition of own wagons in foreign production areas. On the other hand, the use of foreign wagons for their own customer orders is possible. In an R&D project funded by the Federal Ministry for Transport, Innovation and Technology within the framework of the IV2Splus program, RISC Software, in a consortium with Logistikum Steyr, Rail Cargo Austria and OnTec, developed a practicable software prototype for the (partial) automation of empty wagon disposition. In concrete terms, an optimization algorithm for the empty wagon disposition, which is based on a rolling planning approach, has been developed. The main outcome measures from the perspective of customers and companies (such as the avoidance of delayed / premature delivery of a vehicle, minimizing empty vehicle kilometers, trip time, maneuvering procedures) can be considered in a selectively weighted way in the optimization. In the set of disposition-relevant wagons, not only are the wagons viewed by manual disposition taken into account. Moreover, the dates and the locations of the wagons prospectively available (i.e., in the next few days) are pre-calculated on the basis of the real transport chain planning and the real road map, and are included in the optimization. Since significant order quantities (sometimes up to 50 per cent) are often announced by the customers at very short notice, but in any case too late for a timely delivery of empty wagons, an algorithm to calculate a demand forecast was developed and integrated into the prototype for the (semi-) automated empty wagon disposition. This allows for convenient positioning of the likely required empty wagons on the basis of the predicted, expected demands in the individual regions. The implementation of an automated empty wagon disposition with the developed optimization method, using nine weeks of real ordering and wagon movement data, showed that a partial automation of empty wagon disposition is possible, and that excellent results (used as suggestions for the dispatchers) can thus be achieved.